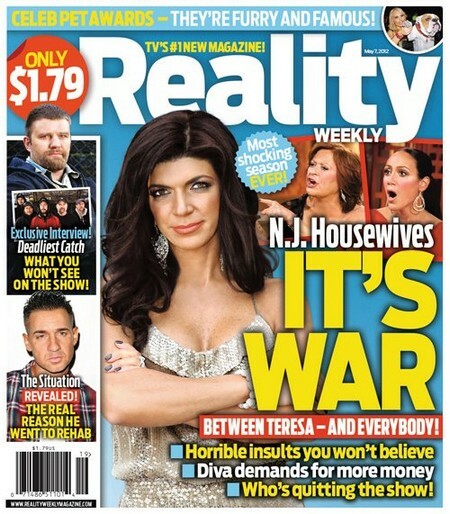 The current issue of Reality Weekly features the cover story ‘Fighting Housewives: It’s Getting Even Worse!’ and references ‘The Real Housewives of New Jersey’ in which Teresa Giuidice is at war with just about everyone – from her husband to castmates. I guess this what makes for good reality TV so don’t expect Teresa to calm down anytime soon. Jerry Springer certainly started a trend… It seems that appealing to the lowest common denominator is what works for Hollywood. According to a production insider, this fourth season, which was taped last summer, is going to be the most explosive ever. “Teresa doesn’t care if she looks like a jerk on camera — she’s just going full-throttle,” says the insider. We also learn on the cover that the issue will explore the real reason that Mike ‘The Situation’ Sorrentino went to rehab. I thought that being an out-of-control alcoholic pill junkie was good enough? But now we need learn that there is more to the story. The cover promises an exclusive interview with the cast of ‘Deadliest Catch.’ They will reveal frightening secrets about what you won’t see on the show. And what do you suppose these secrets could be?